These Chocolate Almond Butter Caramel Protein Fudge bites are rich and creamy and taste almost like the real thing. 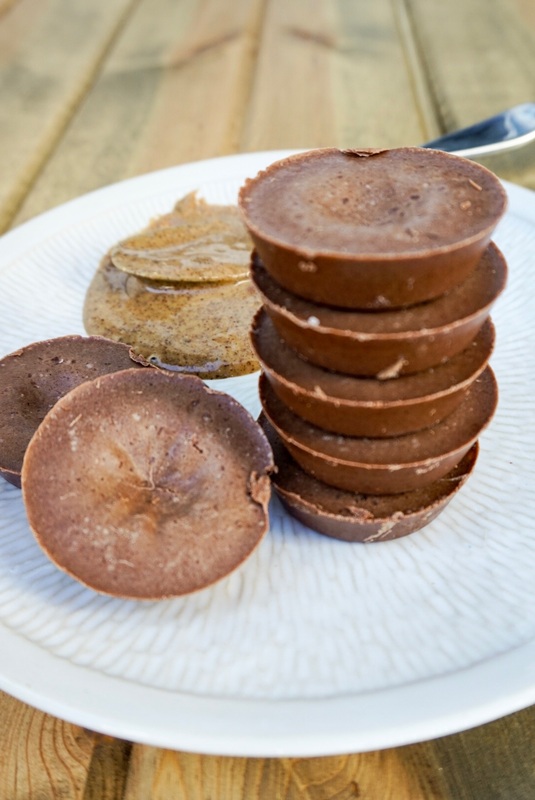 They are low in sugar with a punch of protein and make a great healthy dessert or snack. I am so excited to share this recipe with you all today. In previous What I Ate Wednesday posts you may have seen me snacking on some type of energy ball or protein bite for dessert. 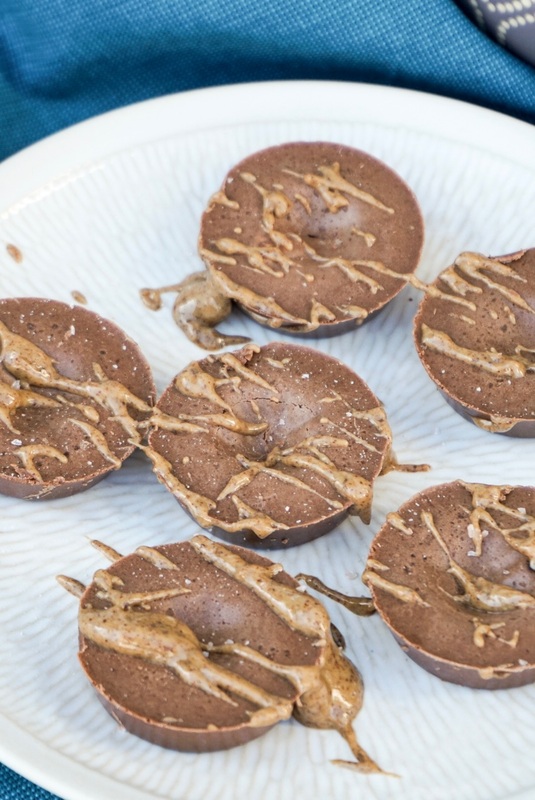 And I have finally found the perfect healthy combination that satisfies my sugar cravings in these Chocolate Almond Butter Caramel Protein Fudge bites. First of all let me address the name of these protein fudge bites, you see there’s not real caramel in them. Rather a combination of almond butter and honey that is a yummy healthy alternative. I have used these two ingredients to create a ‘caramel’ before in my Healthy Dark Chocolate Sea Salt Caramel Popcorn I posted two years ago. I love that you only need a little bit of honey to add the perfect amount of sweetness. These Chocolate Almond Butter Caramel Fudge bites are also so simple to make, you just need coconut oil, almond butter, cocoa powder, Naked Whey Protein, honey, and sea salt. You simple melt the coconut and almond butter in the microwave, then mix in the remaining ingredients and pour into a mini muffin pan, no liners necessary. Then freeze the bites for a few hours. Boom, you can easily whip up a rich and creamy dessert with protein and healthy fats in under 15 minutes! Now lets talk protein. There are hundreds of different protein powders out there you can choose from. For this recipe I used Naked Nutrition Grass Fed Whey Protein Powder. I love Naked Nutrition because their products aren’t filled with artificial sweeteners, flavors, or colors like many other proteins out there. For me, if it’s something I’m eating everyday (and I eat two of these ever night after dinner) then I want the product to have clean ingredients. 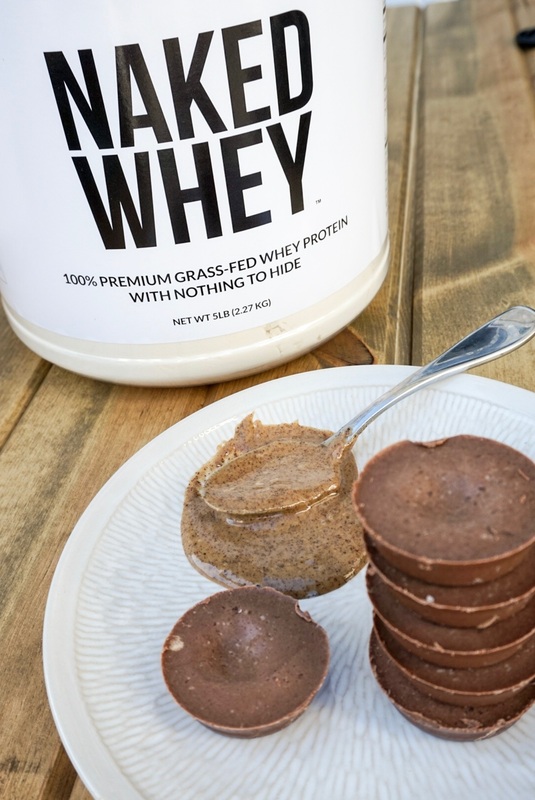 Literally the only ingredient in Naked Whey is grass fed whey protein, how awesome! The whey powder is also loaded with essential amino acids, glutathione, and 25 grams of clean protein per serving. Yes it’s unflavored, but besides making this protein fudge recipe it’s easy to add flavor by using Naked Whey in a smoothie, protein bars, or other recipes. Naked Nutrition also carries other proteins besides plain whey, they have flavored powders, casein powder, and vegan options. And I am also hoping to try their powdered peanut butter next as I love adding a tablespoon to my smoothies. 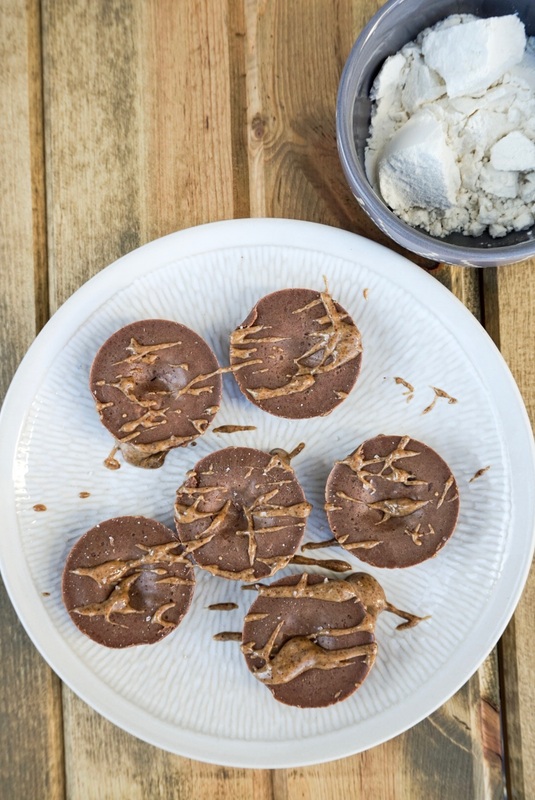 Now lets get to todays recipe for these rich and creamy Chocolate Almond Butter ‘Caramel’ Protein Fudge Bites. In a medium microwave safe bowl combine the coconut oil and almond butter. Place in the microwave for 20 second intervals, stirring between, until the coconut oil is melted. Add the honey, cocoa powder, protein, and stir well to combine using a spoon or whisk. Evenly distribute the bites into a mini muffin pan. This recipe should make about 10-12 mini bites. Sprinkle them with sea salt if desired. Place the tray in the freezer for at least 2 hours. Then use a spoon or knife to remove each bite from the tray and enjoy or store in the freezer. I suggest drizzling a little almond butter on top before eating. This recipe is sponsored by Naked Nutrition. I received product and compensation, but all opinions, words, pictures are my own. Thank you to Naked Nutrition for sponsoring this post. I hope you enjoy the recipe. Linking up with Jenn, Laura, and Arman for What I Ate Wednesday. What do you eat as a healthy sweet treat? Do you eat dessert after every meal? Have you tried Naked Whey Protein? I don’t eat dessert after every meal. I wasn’t born with a super sweet tooth like most people. But I do love a few pieces of dark chocolate after dinner every now and then. I’ve never tried Naked protein but it looks like it might be one of the few good ones out there. My sweet tooth usually hits after dinner to Steph. If I don’t have one of these bites I too reach for some dark chocolate. Anything chocolaty gets me! 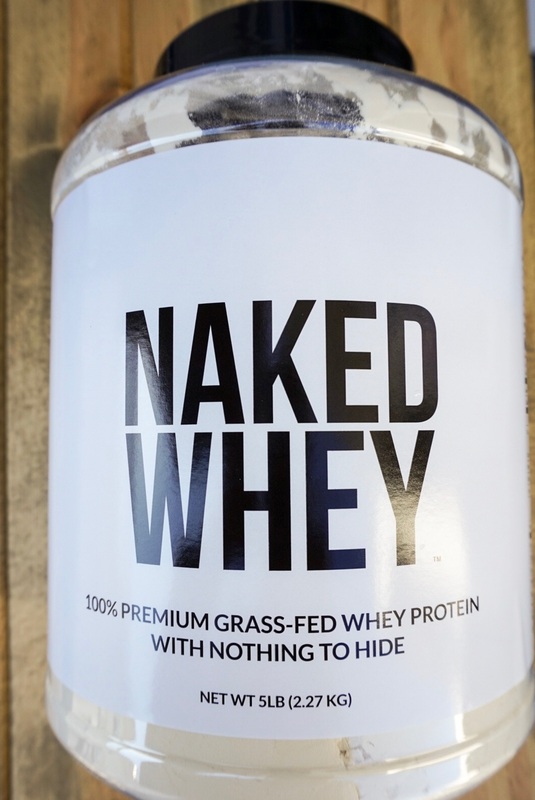 Ooh I love Naked Nutrition’s Tag Line, ‘Nothing to HIde.’ I love products that have really simple ingredients. 🙂 And this fudge sounds yummy! I know right! So many other protein powders have a paragraph of ingredients or sneaky ingredients in fine print, so not cool. Hope you’ll give the fudge a try! I love chocolate nut butter with fruit as a healthy sweet treat. But I also just eat regular ole chocolate sometimes too. 🙂 These little fudge bites are super-cute! Oh I should try chocolate smoothies to satisfy my sweet tooth at night, like a healthy chocolate milkshake. YUM! I use almond butter at least twice a day, just a tab obsessed. Hope you’ll give these a try! I always need something sweet after a meal – these look so delicious!! Love the ingredients too. I’m the same way, usually during the day I eat a piece of fruit but at night I NEED chocolate! saw these on your IG account and had to come check them out! love Naked Nutrition protein powder, definitely need to make these little bites of bliss! Yes I loved the Naked Nutrition and really hope you’ll give these a try, they are SO good! I like baking and this recipe is so great. Thanks! Yes exactly and even though they don’t use any chocolate they taste so chocolaty! Yes one of my favs as well! Hope you’ll give this recipe a try. Amazing Almond butter, looks yummy. Thanks for sharing your recipe. Hope to give this recipe a try.